It’s that time of year again! We are running out of room to house the growing number of kittens, cats and dogs coming to the clinic that need homes to go to. Besides the kittens, we have four great cats looking for homes who would be awesome in the house for chasing moko and rats. We are also caring for three terrific dogs, two which are younger than one year old. These dogs need a sizeable area to run around and plenty of food and water. We have limited space, and accordingly we encourage everyone to get their cats spayed and neutered! The Esther Honey Foundation offers this service free of charge. Donations make this treatment and other clinic services possible but we don’t want to discourage anyone, whether they can donate or not, from bringing in any or all of the free-roaming cats who live around them. Please give us a call if you have any questions on 22336. Come by to have a look if you are interested. We’ll be happy to introduce you. We have adopted a tiny wee kitten that we have called ‘Mango’. 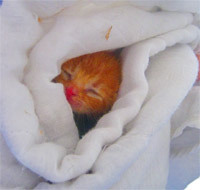 Mango was found on the side of the road with his brother who had already passed away, no mother in sight. At less than a week old, Mango requires feeding every two hours, including overnight so the volunteers are all in surprisingly good spirits considering their lack of sleep. In the past, we have had no luck raising such young kittens as we have had to make up concoctions of milk, egg, condensed milk etc in an attempt to give them sufficient nutrients, but they have not made it. Thanks to a generous donation of a bucket of “Di-Vetelac” baby animal milk replacement, we all have our fingers tightly crossed that Mango will be our first success story from so young.